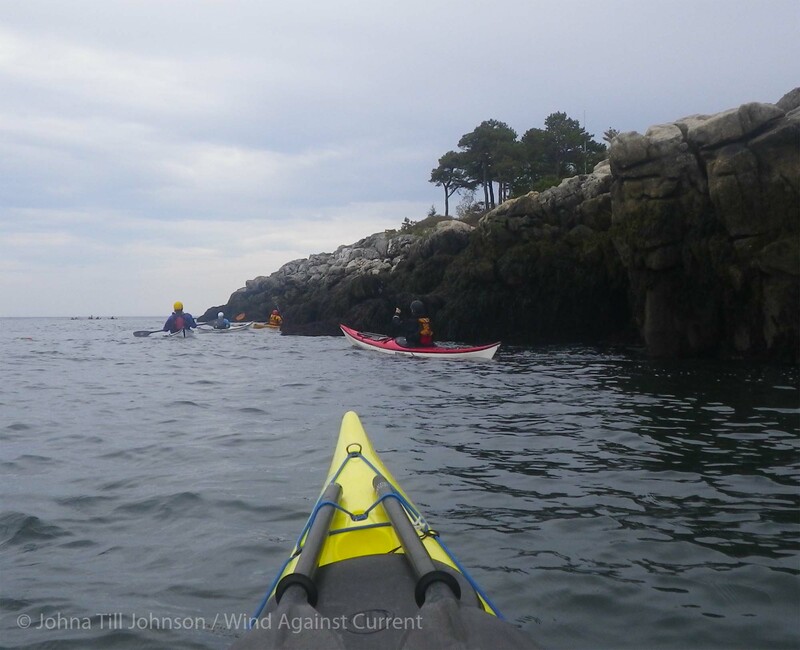 So there I was, bobbing up and down on the frigid waves crashing into the rocky coastline of Maine’s Sheepscot Bay. The swells were substantial—four to six feet, big enough to rip someone from her kayak and deposit her and the boat on separate rocks. That exact thing had recently happened, in fact, to another paddler. Fortunately neither she nor her boat sustained damage, but it was a strikingly close call. One moment she was riding the surf, high over our heads, after a larger-than-usual wave broke suddenly. The next moment she was struggling in the water, and we all winced as we heard the hollow sound of her fiberglass boat crunch into the rocky shore. John Carmody, our head coach and guiding light, engineered a dramatic rescue along with fellow coach Carl Ladd, while the rest of us watched and learned. Mostly we learned what the sea could do to an unwary, or unlucky, paddler. That had been a few hours ago, and we’d made our way slowly down the coast, venturing into rock crevices and balancing on the waves that boiled against the rocks. Except all of a sudden, John Carmody was missing. So there I was… and there John Carmody was not. Someone had just located his empty kayak. And John himself was nowhere to be seen. My second thought: “But it could be for real.” There’s no law that says accidents only happen to inexperienced kayakers. Even the most experienced—even coaches—occasionally get caught. And the conditions were such that a wild-card accident could have occurred. To experience those conditions was the primary reason I was in Maine. The secondary one: Curiosity. From everything I’d heard previously, Maine sounded like a place to avoid. I never could get a straight answer to that one. Apparently the lure was all of those things in combination, which I couldn’t really see. But it seems to me that if you’re going to go out and learn to deal with, say, surf, it’s infinitely smarter to do that in an environment where hypothermia isn’t also an omnipresent risk. My NYC coach, Taino, likes to talk about risks using a slot machine metaphor: One risk might be the cold. Another, the darkness. A third, wind. A fourth, hidden rocks. And so on. When you get a perfect line-up of risks, your chances of a negative outcome increase substantially. And Maine had all those risks, ready-made. Which is why I couldn’t rule out the possibility of John having being caught up in a freak accident. 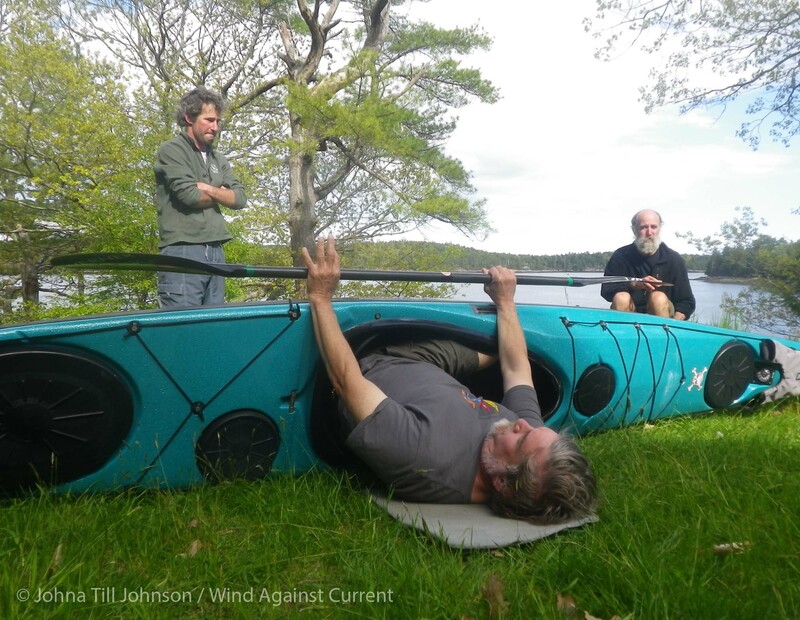 We’d taken a collective break from our busy lives and driven from places as far afield as New York City and Ontario to spend three days in an isolated cabin on the Maine coast to improve our paddling skills. Actually, we spent just mealtimes in the cabin, which had no running water and only solar-powered electricity. Most of us slept in tents on the cabin property, but it was a luxurious sort of camping. After a week of commando camping in the Florida Everglades, I found the clean, cedar-scented composting outhouses and hand-pumped cold, sweet water to be four-star perks. And cooking collectively, we’d been able to whip up gourmet meals including salad, hors d’oeuvres, entrees, and dessert. But we weren’t there to cook. We were there to learn, and learn we did. We’d spent the previous days learning to read, and maneuver our boats in, currents and various forms of moving water. We’d practiced surfing and done rock-gardening. We’d navigated (from charts and on the water) and reviewed weather forecasting. Step Four: And he’s up! The first morning, I managed to do exactly what I’d feared most: I capsized in a fierce eddy in a spot called Lower Hell Gate. Having paddled less than a week before through the swirling whirlpools and 5-knot currents of New York’s Hell Gate, I can confidently say that there’s nothing lesser about Maine’s Lower Hell Gate. Although it’s smaller in scope, it’s no less fierce than its New York counterpart! And there I was, submerged in it. The water temperature was in the 40s, but I was surprised not to feel cold. 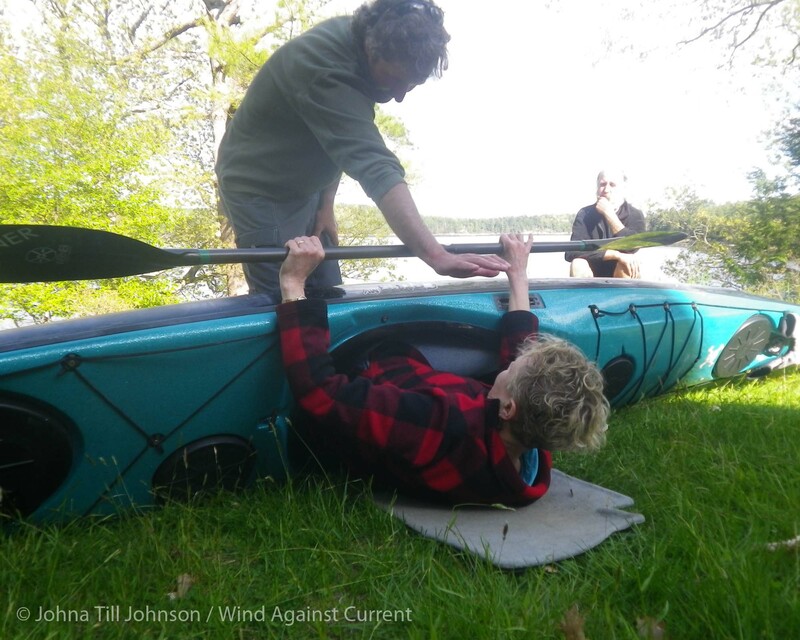 I set up my roll, swung the paddle around… and made it just far enough to grab a gulp of air before falling back in. One more time… and this time, I made it upright. I popped up pleased and somewhat startled—and discovered that nobody had even noticed! Everyone else was too busy playing in the eddy—and going over. There were plenty of wet exits and rescues, but far fewer successful rolls. Later on, someone would tease me about not having gone in… and express surprise that I’d been able to roll my way out. I learned something useful that day. The reason I’d gone in was that I’d done what I thought was the right thing, and edged into the current. (Plenty of other folks did the same thing.) Turns out that’s exactly the wrong thing to do: You want to “moon the current” by edging away. That drives the water under the bottom of your boat, and lifts you up rather than sucking you under. This was one of the most valuable lessons I picked up during the symposium. I later learned it applied to waves as well. Normally, you’re taught to edge into the wave, and brace along with the edge. That does work, but it gives the wave the ability to grab you and spin you downstream, then carry you along with it. That’s not always a bad thing—if you’re in open water, the only harm is that you might end up somewhere you don’t want to be. Julie adds a flourish to her great edge…. But if the wave is crashing into rocks, you might end up crashing into those rocks right along with it—exactly what happened to our unlucky paddler. A better approach is to edge away from the wave—to “moon the wave”, in other words—and turn your boat so you carve right into the wave. This allows you to go up and over the wave, and avoid the rocks. It doesn’t work if the wave is particularly powerful, though. You need to make a judgment call about how strong the wave is, and how close it is to breaking, before you decide what to do. In fact, that approach wouldn’t have helped our unlucky paddler. Nothing really would have—the wave that grabbed her was simply too strong. She didn’t even have time to roll, she said when I asked her later. One second she was thinking about it, the next second she was literally ripped out of her boat—she never even had time to pull the tab on her spray skirt. Could that have been what happened to John? Had a wave “et” him? We fanned out in a search pattern, scanning the ocean and the rocks near the water’s edge. Caroline, one of the coaches, climbed onto the cliffs to get a better vantage point for the search. The tide was going out, I thought to myself. If John had been knocked unconscious and sucked out of his boat, he’d be floating towards the horizon. So I kept scanning the gray-blue waters for signs of his black-clad body. Part of me was unemotional, dispassionate. We needed to think about where he might be, and do what we could to find him. But another part was quietly freaking out: I’d briefly met his wife, who seemed to combine grace and strength in equal parts. How could she handle losing him? And what about us? A world without John Carmody seemed dimmer, grayer, less full of potential. Suddenly I heard a shout, and turned around. There stood John Carmody, paddle beside him like a staff, standing on the rocks, laughing at us. It was as if the sun had come out of the clouds. (In fact, in my memory, the sun did come out from behind the clouds just then.) In a few moments both John and Caroline were back in their boats, and we all headed towards the beach, and the end of our session. What did I learn during my Maine symposium? Well, I learned about reading the water, and mooning the current. I learned that it’s okay to capsize in cold water, and that I can roll my way out of it, more often than not. I got some good ideas about what features I want in my next drysuit, and I’ve stopped being irrationally afraid of capsizing in cold water, just because it’s cold. I learned several useful techniques that I look forward to practicing, particularly when it comes to rolling more effectively. I got some ideas for how to pull off a rescue in dangerous waters, though I’m far from being able to do so as flawlessly as John and Carl did. Most of all, though, I learned the indescribable allure of cold, fog, rocks, sweeping tides… and miles and miles and miles and miles of coast with nothing but pine trees. Vlad and I are already planning our next trip to Maine! This entry was posted in Kayaking and tagged John Carmody, Kayak, Kayak Strokes, Kayak Symposium, Kayak Technique, Kayak Training, Maine, Maine Sea Kayaking, Rock Garden, Sea Kayaking. Bookmark the permalink. It was a pretty interesting session all around–but beautiful! Thanks for reading, and posting. I was pretty psyched about it thanks! And thanks for the kind words. Regarding sharks–I’m not so sure :-). Wait until you see Vlad’s “baby seal” photos… and where there are seals, there are sharks…. Me too. Thanks for reading and posting! Thanks! Fortunately he was just training us (the other coaches, more likely). But always a good exercise. Thanks for sharing Johna. Endless “pine trees” can cause hallucinations, too. Where to next in Maine? Eastport? We are curious about your thoughts on your next dry suit. We haven’t decided on where (or when) in Maine; my one request is that we pick a “home base” so that we can do day trips, so i can practice in conditions. Regarding the drysuit, I’m looking for a stronger neck gasket (my current one has failed twice), as well as switching to a dropped front-relief zipper. I’m also mulling moving to a men’s medium versus women’s–the women’s waist is more form-fitted, which means pulling the waistband over my hips can be a challenge, particularly if I have a couple of layers of long underwear on. My goodness you are both so brave. Your story gave me chills 3 times. Thanks! It was actually quite a lot of fun, not really scary at all (except for the few minutes when I genuinely thought John might be missing). I know, I enjoyed your story immensely but deep water and me……….flipping over …wow! That is why you trained and executed your training when needed, but I could never do it. I could parachute again but XXXXXXXX deep water . I really do enjoy reading both of your stories and fabulous photo’s though. Have a great weekend! riveting! love this post. thanks for sharing!! Thanks for reading, Lola! And for posting. I’m with Lola. Your post was riveting from beginning to end. I had no idea that there was so much to kayaking. Much respect from me, Johna. That’s what’s so wonderful about kayaking–it can be anything you want it to be. You can spend a lifetime paddling happily without ever running into conditions like these. Thanks for reading, and posting! :-) You missed a great symposium, guys! Some seriously bouncy water. Johna , about your Next Drysuit ? Stephen–see above. It will be Kokotat, definitely–I really appreciate the quality of their suits. But the rear relief zipper is worse than useless, and I’m not sure the women’s cut works well for me. So it’ll probably be a custom design, with dropped front relief zipper and extra-strength next gasket. I will attest front relief being kinda nice, even if it requires additional accoutrements and *ahem* practice. I’ve never had call for the back door. Considered seriously attending the Symposium but the logistics and cost of so many trips from Spain to the States (this year it will be 5) put me off. You sure had some wonderful coaches. Thanks for your great report even if it made me a little envious. Sign up now for next year!! (Seriously, I think there’s a wait list already). You certainly learned a lot of good lessons. I’m glad that your story had a good ending and that John was indeed OK. The waves and rock description had me very nervous. I think it’s awesome that they have symposiums and that you have an opportunity to learn to kayak properly. It’s good to know there are coaches. I’m so naive (okay, dumb). I thought one just gets in the water and starts kayaking and all is right with the world, but I see it’s important to learn to kayak properly and have the right training, especially for a better kayaking experience. Enjoyed your post. Thanks! Thanks for reading, and posting! 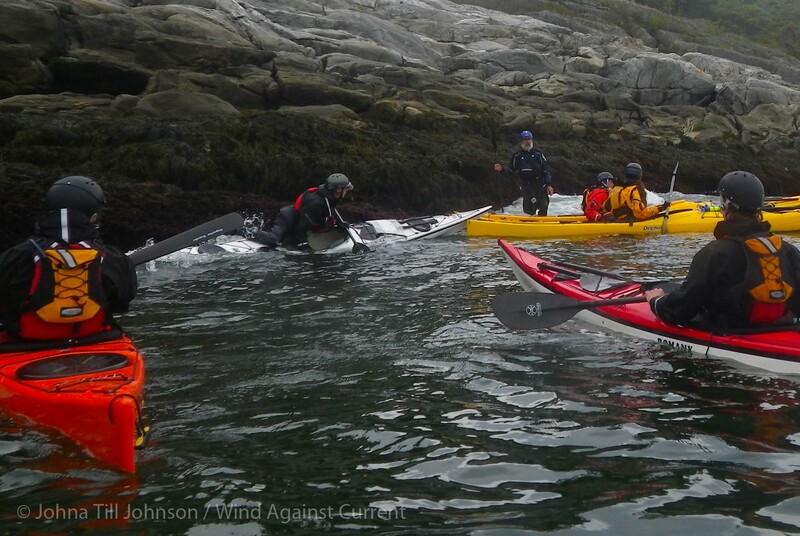 Yes, a lot of people think there’s nothing much “to” kayaking–you get in the boat and go. And they’re right! There are plenty of kayaking scenarios where that’s true–the nice thing about the activity is that it doesn’t have to be all complicated. You can put as much, or as little, effort into it as you’d like. I actually went kayaking for the first time last week. In the Gulf. The most current I got was when a jet ski went by. Boring. However, HOWEVER….after reading this, boring is great. Whew! I’m just glad you made it back OK. But oh, Maine…..I do hope to get there one day. I hope you make it there, too! And there’s nothing wrong with “boring”. Congratulations on your first time paddling—many happy returns! Oh dear, that’s not for me, but very interesting reading, Johna. You’re brave!! Thanks for reading, and posting! 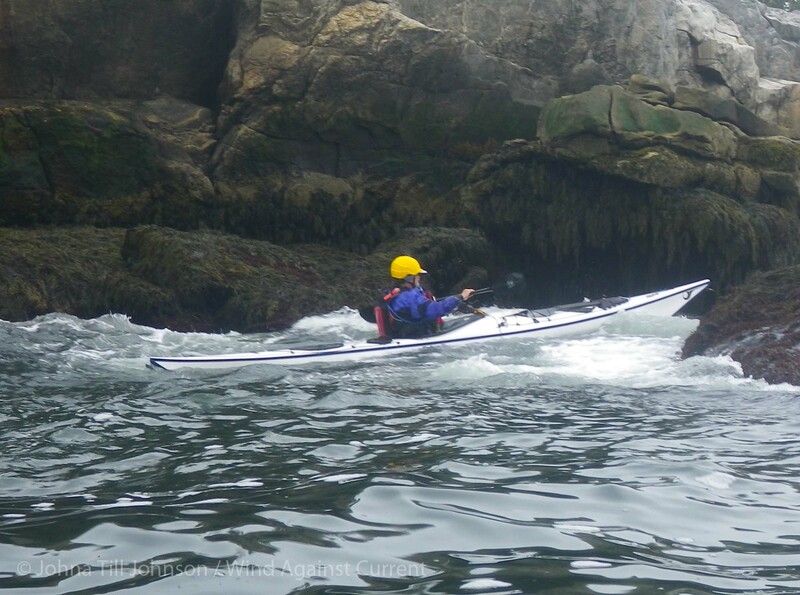 Actually, it was an enormous amount of fun–it’s always a good thing to push your skills to the limits, and Maine provided that. If you like Maine then you will love Alaska. I hear you! Definitely paddling in Alaska is on my wish list! Thanks for reading, and posting! Wow what an amazing experience. I don’t think I could be that brave. Well done and keep going. I’ve never been to Maine but for some reason, I feel this inexplicable pull towards the state. I actually wrote a post about it entitled “Reasons why I want to move to Maine”. Congrats on being Freshly Pressed! :) I enjoyed reading this post. Oh yes, I love her poems. The famous line, “Childhood is the kingdom where nobody dies”, always sends a shiver down my spine. Amazing adventure though the parts of it were scary. I never tried kayaking being frightened of water. But the your story is very inspiring for a beginner. Thanks! And water doesn’t necessarily mean *deep* water… there are plenty of lovely, shallow places to paddle! We have very different approaches to ‘risk’ – thank goodness. Mine is more like, should I take an umbrella out with me today. Very interesting blog, enjoyed it, thanks for sharing. You’re welcome! And thank for reading, and posting. 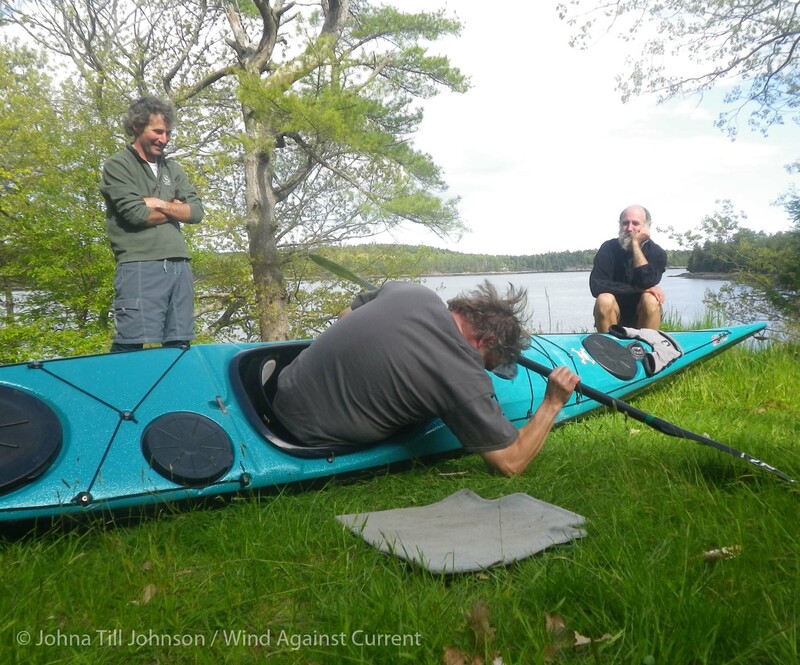 It’s great fun to read about the adventures of serious kayakers. My skills run to gliding on a glassy lake edged by morning mist. Why thank you! Lovely image (though why am I not surprised, given your day job?) I love your site, by the way. Both of them! Great post, riveting and very glad to read that everyone was okay. Love Maine, used to live there and your description took me back home. Maine, the way life should be – thanks for the memory. Thanks Mary! I bet you have some lovely paintings of Maine…. OH MY GOSH! What an experience. I’ve only Kayaked in the sea once and my biggest fear was sharks. I was keenly aware that I wasn’t on the top of the food chain in the sea. I’ve never rolled in a Kayak…knock on wood! I even did a transfer from one Kayak to another in the sea and didn’t fall in or roll it. After my kayaking in the Pacific I’m not sure it’s for me. I think the calmer waters of the slough are more to my liking. You’re one tough cookie! Loved the write and images. Thanks, Deborah! Actually, rolling in a kayak is a *good* thing. The better your roll, the more risks you can take–and the more fun you can have. Thanks! We’re very excited, as you might imagine! I only tried kayak in a lake where the water is calm. I should try it in a wavy sea in the future. No arguments from us! Wavy seas are the best kind…. I’m not a kayaking type of person, but this made me chuckle out loud. Brilliant! Yeah, I wish it was all lies but ‘tsnot. Reblogged this on The Life of Madam F.~An Ever After Story. So happy you are joining us! But watch out…. it’s addictive. Before you know it, you’ll be surfing waves in Maine (or the Pacific Northwest) or battling alligators in Florida :-) :-)! Which you know very well! 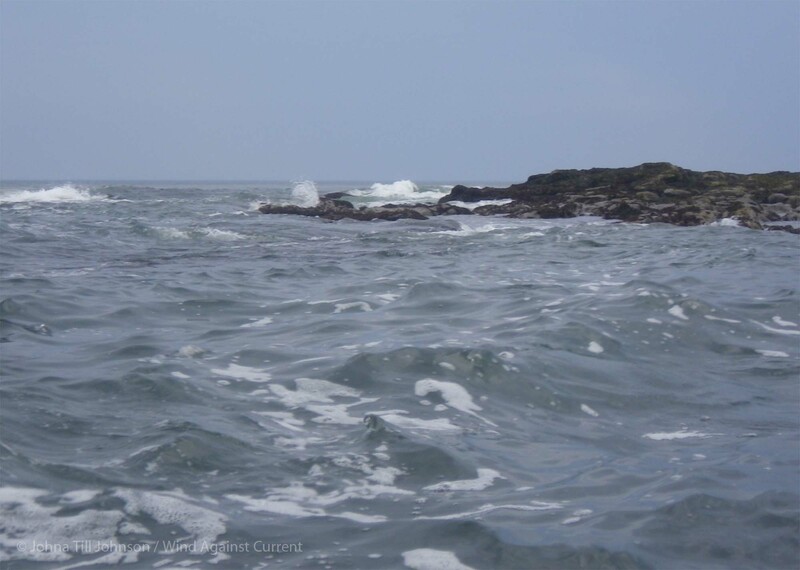 Since you’re not at all reluctant to go swimming in the cold Atlantic… Thanks for reading, and reposting! 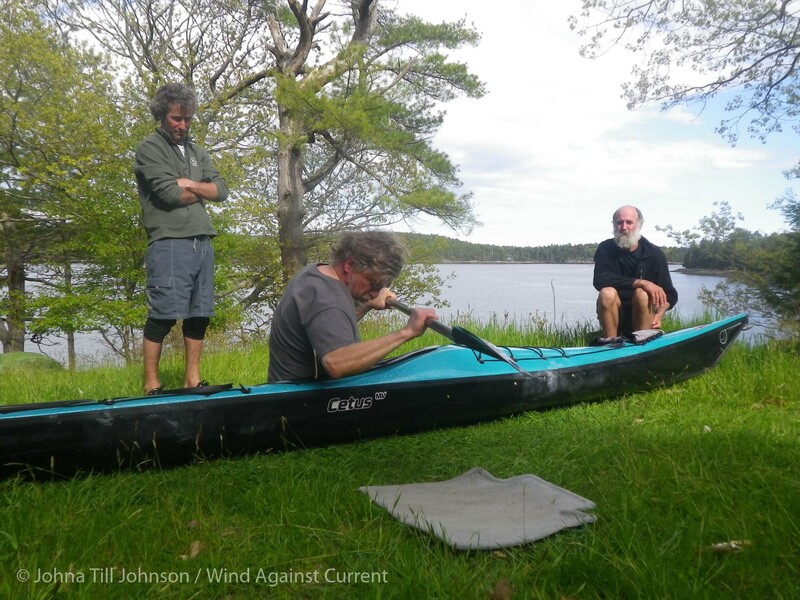 My question: remind me why exactly it was that you went “to spend three days in an isolated cabin on the Maine coast to improve our paddling skills”? (Skills that are already superb?) In all I’ve heard or read about Edna St. Vincent Millay, the part about her kayaking in rough icy waters was never included. I guess you were just born a lover of risk and challenge! Actually, I’m teasing because my hat is off to you. To you both. In a million years I would never, but it’s exciting to read about your adventures vicariously. Actually, it’s John and John.. John Carmody and John Ozard. And Carl Ladd. Any time that trio wants to coach, count me in!! 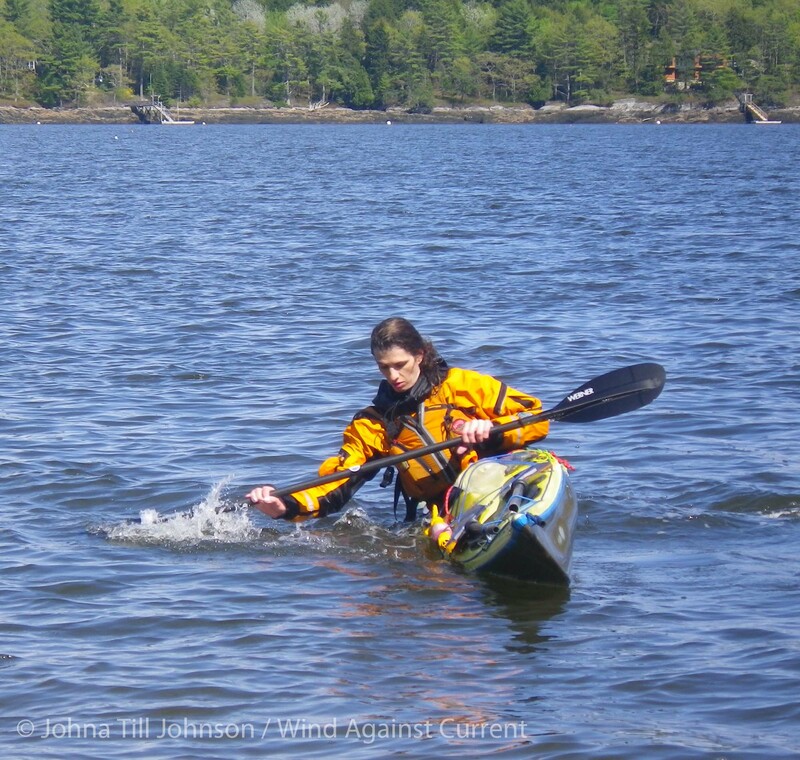 And since I knew Vlad wanted to paddle in Maine waters, the rest was easy…. Good to hear from you, as always.. thanks for posting!! I just noticed that you were freshly pressed, congratulations! You deserve the honor, your blog is fabulous. Great blog! You’re an excellent writer. I’m loving your descriptions of John’s coaching. I’ve also had the great good fortune to be coached by John and your account of him is spot on. I’ll be at this year’s symposium, so look forward to meeting you then. Thanks so much for the kind words. Which symposium are you going to? The one in August in Rhode Island? If so, I’ll see you there….! I’ll be at the mid coast rendezvous in Maine in October. Too bad I’m not going to be in Rhode Island. Paddled there once, and had a great time! Ah, I think that’s one that already has a mile-long waiting list. :-( Sorry to miss you! Johna I so enjoyed this post back in May. I was just having a look through yours and Vlad’s FOUR Freshly Pressed awards and saw that this one was awarded too. Fantastic and congratulations! Thanks Sue!! I was actually surprised myself looking back at the posts… I was like, “why does this post have 100 comments?” Then I remembered it was Freshly Pressed, to my gratitude and amazement. Maine’s a fantastic place with all kinds of interesting surroundings. I loved my first long solo trip and had my own difficulties. Thankfully, I didn’t get dumped but it would have been fine, except for my day of the cliffs. Going solo has the added risk of not getting help. I love being out there so much that to die there is fine with me. Thanks for reading, and posting! And while Maine was great, I’m pretty sure I wouldn’t want to die there—but a long solo trip there is a fantastic accomplishment, indeed!